I realize now that my adoration for things was breeding contempt for everything else, even in my son. My kids, food, tidy house, clothes–the list could go on. Unfortunately, the first thing that pops into my mind when I see the word adoration, is not God. I live in a state where sports can be more adored that anything else. Maybe you do too? I used to secretly feel a sense of security, that my heart and mind were in the right place. After all, I did not place sports above God. But recently, I am learning any sense of security placed on where my walk with the Lord is, instead of my security being placed in Him, should immediately be a red flag. My security should be placed in Him, not on whether or not I think my adoration of Him is well placed. I am reading 7 (Jen Hatmaker) with our girls’ small group and I didn’t realize until we got to the sections on clothes and possessions how out of sync my definition of adoration really was. Even more halting was seeing it replicated in my son. We replicate who we are. My adoration of “things” being sewn into my son, stopped me in my tracks. 22-23 “Your eyes are windows into your body. If you open your eyes wide in wonder and belief, your body fills up with light. If you live squinty-eyed in greed and distrust, your body is a dank cellar. If you pull the blinds on your windows, what a dark life you will have! 1. I was so covered up, the windows (or eyes) so dirty and cluttered that no light was coming in, or going out. I have so much stuff, so many things that are blocking my eyes from seeing. I have so much stacked around me, gathered to me, that my arms trying to hold it all, prevents me from seeing anything else. My adoration of things, possessions, clothes, has prevented my eyes from truly seeing. My heart was a dank cellar, it’s dimness mirrored in crystal clear pools in the eyes of my son. Toys, things, games, treats, all were more important than anything else. Our adoration of things bred contempt for everything else. What to do? GIVE. The more I gave, the less contempt I had. The less I had, the easier it was to see the world around me. Time with my kids is more important than things. Sometimes we cannot even seem to get to our kids for all their things and vice versa. 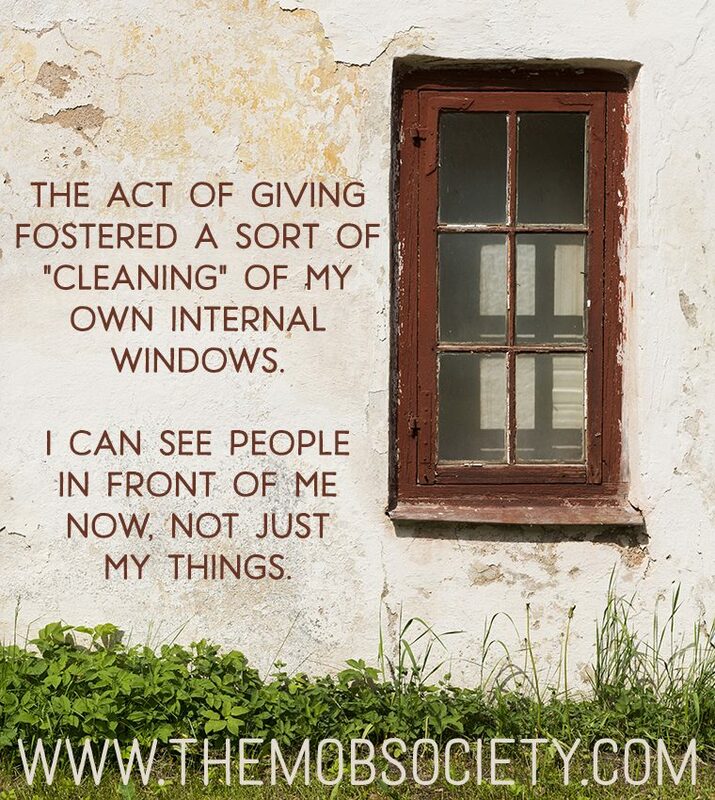 The act of giving fostered a sort of “cleaning” of my own internal windows. I can see people in front of me now, not just my things. 2. Adoration of God alone breeds a life of contentment. When you adore God alone, there is no place contempt. We are guaranteed to have contempt when we adore something other than God. More than anything, I want my son to pursue God and adore Him. If I replicate myself, then I have to actually adore God more than anything. My adoration or lack thereof can potentially influence the way he prioritizes his relationship with God. I am asking God to help me learn how to adore Him more. How to teach my son to adore Him, placing Him above all else. Practically for me, it means more giving and less getting. It means saying “no” now, so my barns don’t fill up that way again. I am certain I’ll need you to remind me in a month, when my eyes start to cloud over and I start gathering more things around. A habit of 36 years is hard to break. I am posting Matthew 6:22-24 where I can see it frequently. Lord, I long for my heart to adore you over anything else. I want my priorities placed on You ordering my steps, not on what I think is needed or wanted. I want to point to You, so my son sees You are the One to go to first. You are the Beginning and the End. We start and finish with You. Thank you for paring down my life to a place where I can see. Give my children eyes to see past their “things” too. Thank you for all you given us. May I be a good steward of what you have entrusted to me. 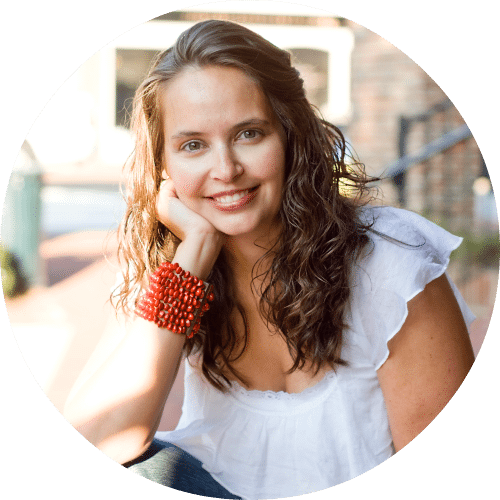 Wife to one tall man, mom to two littles (1 boy, 1 girl), lover of laughter, passionate about freedom, ending human trafficking, and you. Praying you know today the value you hold as the daughter of the King.